This Nepenthes is a hybrid between N. X rokko(which is a hybrid between N. thorelli X N. maxima) and the species N. spectabilis. I didn't seek this plant out intentionally to buy it. It was given to me from Tony at Exotic Plants Plus as a "bonus plant" for doing business with him. It's turned out to be a very nice Nepenthes! Over the years I haven't paid much attention to it. It's put out several basals and just goes about its business without any problems. Sometimes the Nepenthes you don't pay attention to do the best. I grow this hybrid in full sun in a hanging pot. It's a vigorous grower that's never had any problems since I've had it. 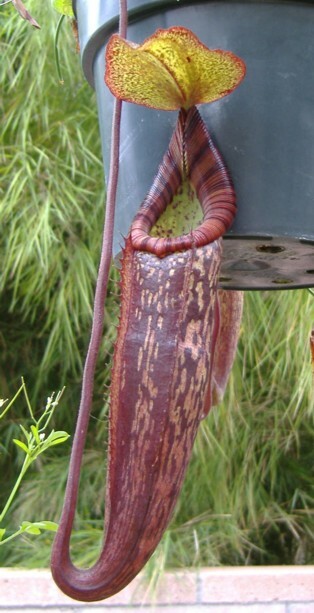 Now that it has multiple vines, it has put out some upper pitchers that look really nice too. Considering how really cool this plant is, I should pay more attention to it! Also, hybrids with N. spectabilis tend to be really nice and this hybrid is no exception. As with seed grown plants from Exotica, once they're gone, they're gone. Then they appear every once in a while on Exotica's list as rooted cuttings or on Ebay from private growers it seems making availability limited.